Advent Calendar - December 25th. by PaulEMoz in "Christmas NiGHTS", "NiGHTS... into dreams", "Sega Saturn", "Sonic Team", "Yuji Naka"
And so, finally, we come to the last game of the Advent Calendar. It's a game I've waited about thirteen years to play. For all I love the original, and I do really love the original, I never managed to get hold of this little oddment. It was given away as a magazine cover disc... what an awesome present that must have been! The original NiGHTS... into dreams saw you starting out as either Claris or Elliot, brother or sister, in the world of nightmares. In order to banish these nightmares, the mysterious entity NiGHTS would come along and, under your control, defeat the stuff of nightmares and allow the kids to sleep peacefully once again. It wasn't just one of the best games on the Saturn (a much, and unfairly maligned system)... as far as I'm concerned it's one of the best games ever. It has an utterly magical feeling and quality to it... the gameplay itself is floaty, almost dreamlike, as you swoop and soar around the landscapes. It's a high score game in essence, and a joy to play in that regard. But it just has that certain something that mere programming doesn't provide, that special element that elevates it into something truly special. Enough waxing lyrical on the original game. Now I'm going to wax lyrical about this one instead. 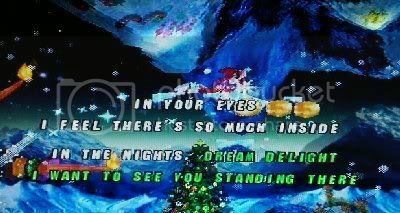 Christmas NiGHTS... into dreams is a cut-down version of the original game... you couldn't expect SEGA to give away a full-sized product. But whereas you only get to play one full level and boss for each character, they've stuffed a load of lovely other goodies into the game instead. Hmmm. Just a 'C'. Well, I am rusty... I suppose it's not a bad start. When you load up the game, you're prompted to check that your calendar date is correct. Or maybe incorrect... Christmas NiGHTS tells you from the off that there are many calendar-activated surprises contained within the game. The intention, I would imagine, is that you play the game every day in order to discover what treats lie within. Maybe I will! There's an idea... a post a day for a year, alongside whatever else I'm writing about. Don't let the bells end! As it is, I played this on Christmas Day, December 25th. And sure enough, as NiGHTS drifts lazily around the landscape, you'll notice Santa and his reindeer flying by at times. You also get different music on Christmas Day... and it's absolutely lovely, not quite carol singing but distinctly festive in tone. That's a big, ugly fella. At least he's in the spirit of things, though. 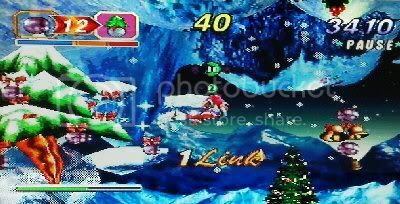 The graphics are (obviously) Christmassy in this version of the game, with snow everywhere, Christmas bells to collect and Christmas wreaths to fly through instead of the normal rings. 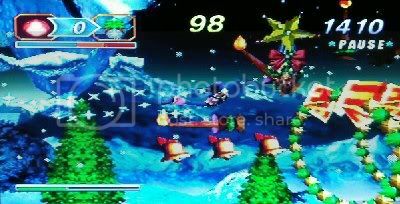 NiGHTS himself wears a Santa outfit, and even the end-level boss is wearing a Christmas hat. Who'd have thought it? Playing through the game gives you the opportunity to unlock some of the Christmas presents that are hidden in one of the menus. There's a good number of unlockables which should keep anyone playing for ages. Lots of the unlockables are gallery items... artwork from the original game, mostly. But there are other things available. 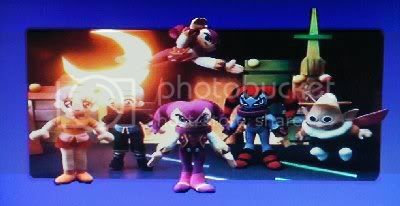 One item I unlocked was called "NiGHTS Goods", which is a collection of pictures of promotional and retail items related to NiGHTS. I never knew you could get so much stuff! If anyone can get me a plushie or keychain, I'll be your friend forever. Look at those beauties! Wonder if you can still get any of them...? One quite frightening item, is called, simply, "Karaoke". Ahhh, that most Japanese of traditions. When you complete the game, you're "rewarded" with a movie of NiGHTS flying around the game's terrain, while a cheesy song plays. Unlock the Karaoke option, and you get to sing along with this cheesy song! No, I haven't done this, and I don't intend to, thanks. Leona Lewis expected to land another Christmas Number One. For a freebie, Christmas NiGHTS is quite astonishing. It's a short game, sure, but a lovely one all the same. I've used the word "magical" before, but it truly is that. And it's packed with wonderful fan service. I have no idea how much is left undiscovered in here, but I certainly intend to find out. 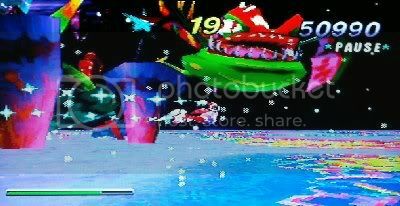 Christmas NiGHTS... into dreams is a love letter to both fans of the original game, and the original game itself. It's a glorious addition to anyone's collection, and I'm really glad to have finally played it after all these years. Merry Christmas!